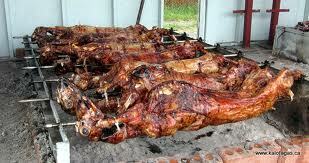 The Typikon calls every festive meal a “great consolation for the brethren.” Pascha, which in importance stands outside the ranks of the twelve main feast days and is called the “Feast of feasts and the Celebration of celebrations,” presupposes a particularly abundant and diverse trapeza. However, in allowing this consolation, the Church nonetheless does not particularly endorse refinements that require many components or dishes that are difficult to prepare, considering pretentious culinary novelties to fall under the sin of gluttony. On the Paschal table should be several simple, inexpensive, but remarkably tasty dishes that bear within them a deep symbolic meaning. From the very first week of the fast, the responsible housewife begins to save onionskins, which color eggs in the most proper reddish-brown color better than any imported powders. Painting Easter eggs is a real art. Miniaturist artists are able to depict churches and monasteries, fantastic bouquets, celestial lights, the sea, forests, steppes and mountains, saints and angels on the convex surface. Except that all this painting comes from the influence of the West, and true Easter eggs are always colored with onionskins! 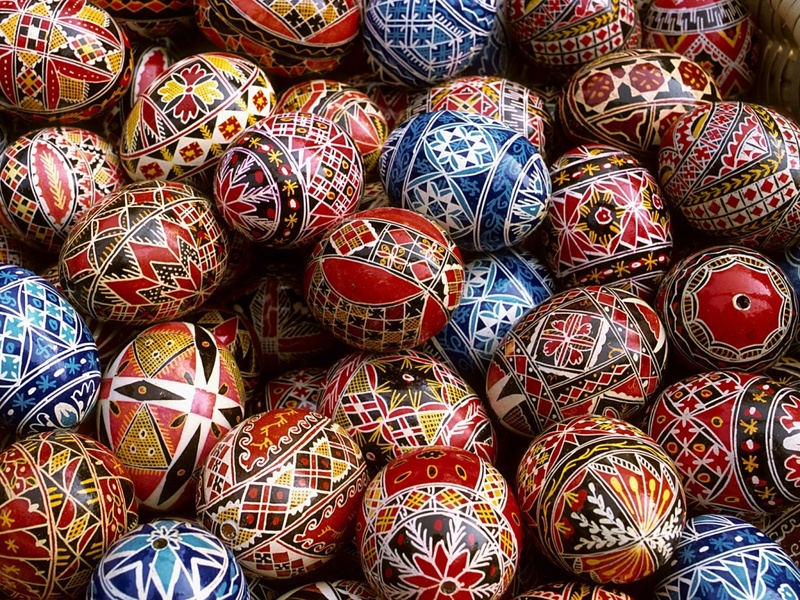 The explanation given for the custom of dying Easter eggs red comes from a rather late apocrypha that speaks of the Roman Emperor Tiberius’ conversion to Christianity. Wishing to put an end to the preaching of Mary Magdalene, he declared that he would sooner believe in a white egg turning red than in the possibility of the resurrection of the dead. An egg turned red, and this became the last argument in the polemic that culminated in the Roman Caesar’s Baptism. 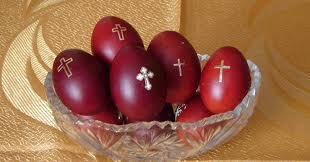 The custom of exchanging colored eggs entered the life of the Church. The symbolic meaning of the egg as the beginning of a new life was known even earlier. Christians saw in this symbol confirmation of their faith in the coming general resurrection. The Easter egg’s red color symbolized the all-conquering Divine Love, which alone could destroy hell! The Paschal kulich resembles artos in form, bread that is blessed at the Paschal Divine service and distributed on Saturday of Bright Week. The Paschal artos is a symbol of the Lord Jesus Christ Himself. Addressing the disciples, He said: I am that bread of life… This is the bread which cometh down from heaven, that a man may eat thereof, and not die. I am the living bread which came down from heaven: if any man eat of this bread, he shall live forever: and the bread that I will give is my flesh, which I will give for the life of the world (John 6:48-51). Artos is always prepared from leavened dough. This is not Jewish unleavened bread, in which there is nothing living. 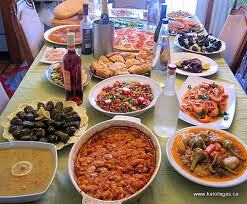 This is bread in which leaven is breathing, life that could last forever. The ontological status of artos does not allow the addition of anything superfluous. It contains no bakery goods, no aromatic additives. Artos is a symbol of the most daily bread – Christ the Savior, Who is Life! However, the Paschal kulich, this artos that is brought to the festive table, does, to the contrary, have bakery goods, and sweetening, and raisins, and nuts. Properly prepared Russian kulich does not go stale for weeks; it is aromatic, beautiful, heavy, and can stay good, without spoiling, for all forty days of Pascha. This modification of the artos also has a symbolic basis. 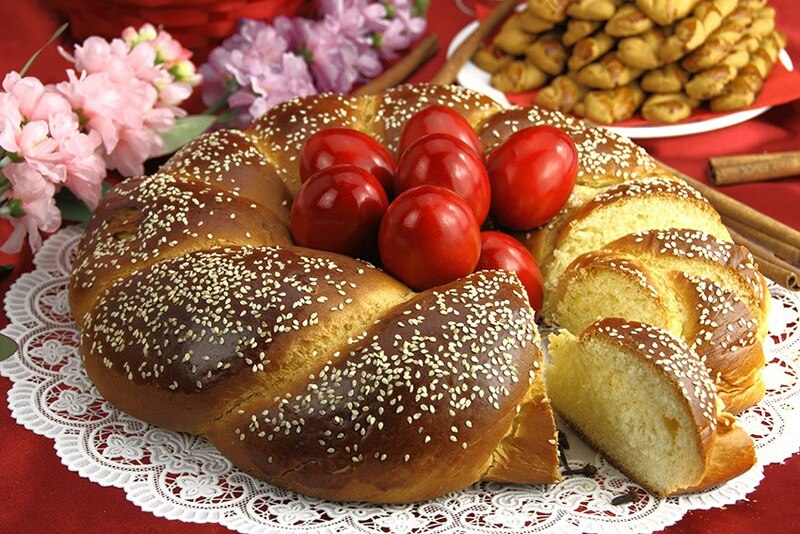 The Paschal kulich on the festive table symbolizes the presence of God in the world and in human life. The sweetness, bakery goods, and beauty of the Paschal kulich, in this way express the Lord’s concern for all of human existence, His compassion, mercy, condescension to the infirmities of human nature, His willingness to listen to any prayer, to come to the aid of the least sinner. The name the “Sweetest” given to the Lord Jesus in one of the most ancient akathists helps one to understand the symbolism of the Paschal kulich. Yet another indispensable element of the Paschal table that is just as aromatic and beautiful is cheese pascha, whose symbolism is also deeply rooted in Holy Scripture. A land of milk rivers flowing through kissel banks is one of the most widespread archetypes characteristic of the most diverse cultures. Milk rivers flowing along kissel banks were an eternal dream of Russian peasants, which was manifest in stories and folk songs. The Lord, addressing Moses, promises His chosen people a good land and large, unto a land flowing with milk and honey (Ex 3:8). This characterization of the Promised Land persists throughout the entire story of the Passover, the passing over of the Jews from Egypt to Palestine. It is a prefiguring of the Heavenly Kingdom, the path to which is for a faithful person more difficult than the forty-year journey of the Jews. Its “milk and honey” is an image of the endless joy, the blessedness of the saints found worthy of salvation and eternal sojourn before the throne of God. Thus cheese pascha is a symbol of Paschal joy, the sweetness of paradisiacal life, of blessed Eternity, which is not an endless continuation of time, a senseless repetition of the same thing but, according to the prophecy of the Apocalypse, “a new heaven and a new earth.” And the “hill,” the form into which pascha is made, is a symbol of the Heavenly Zion, the enduring foundation of the New Jerusalem – the city in which there is no temple, for the Lord God Almighty and the Lamb are the temple of it (Revelation 21:22).